A short paragraph in Genesis becomes the blueprint for an epic science film. Noah presents us with Crowe playing the eco warrior determined to save nature and cleanse the world of human wickedness by ensuring there’s no one left to be wicked. Tubal Cain as played by Ray Winstone, is involved in a macho face off with Crowe. I couldn’t get over the absurdity of the angels of light trapped in rock, they look like something out of a cereal commercial. Noah and family look like backpackers in a post industrial world and I’m not sure this will go down well with those who revere the bible. Indeed, the film has to steer fairly cleverly through the offence-sensitive strictures of contemporary monotheistic religions (but it is still banned in some Muslim countries). Noah as eco-warrior is a pragmatic solution to this. Aronofsky shows Noah as self destructive obsessive (just like the ballerina in his film Black Swan) and Crowe is good on carrying the portentous weight of the Creator’s designs. His family drama ensures the stark simplicity of a parable considering the gloomy menagerie they’re sailing on (Adam and Eve look like two aliens wandering around in a pretentious commercial). Noah invites us to spot other biblical stories it contains. The most obvious is the recreation of life after the flood, the ark as a Garden of Eden. There is also an allusion to Abraham being prepared to sacrifice Isaac as Noah holds the knife over Emma Watson’s infant. The ark itself is a tar splattered wooden box containing masses of anaesthetised fauna, and is also a floating forest. I couldn’t help comparing it with John Huston’s version of this story in The Bible made in 1967. That film didn’t have the benefit of CGI but was a faithfully sentimental rendering of the bible story. Its inoffensive jollity papering over the scientific implausibilities of the events. 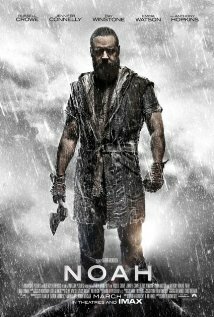 Crowe’s Noah is a darker even malignant force in a world beyond Hobbesion nightmare. Patchy but usually good to look at.